Taking place currently on the DL Deals Store is an Android smartwatch giveaway, allowing you to choose whichever prize you would like. 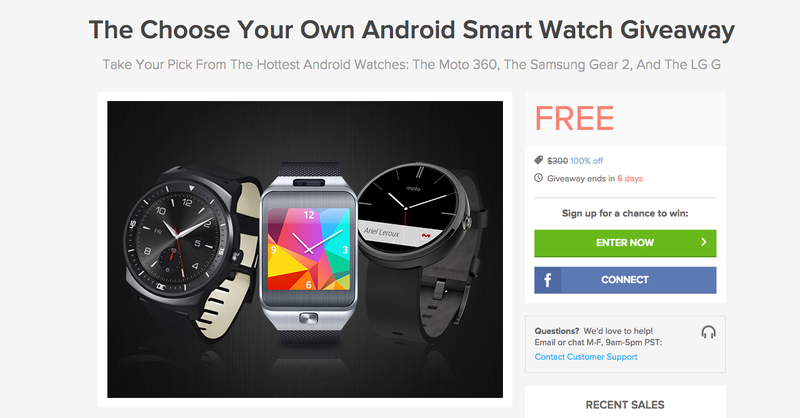 Listed is a Moto 360, LG G Watch R, or a Samsung Gear 2. Do note, the Moto 360 and G Watch R are Android Wear devices, while the Gear 2 runs Samsung’s smartwatch OS called Tizen. The Gear 2 is only compatible with Samsung-made smartphones, while the Moto 360 and G Watch R can be synced to any Android device. To enter, all you need is an account on the DL Deals store, which can either be linked to your email or even a Facebook account. As for entries, you can tweet, follow us on Twitter, +1 us on Google+, or share the giveaway on Google+. That should be plenty of different entry options for you. Again, up for grabs, and determined completely by you, is a Moto 360, G Watch R, and Samsung-made Gear 2 smartwatch. If you win, you can choose whichever one you desire. The giveaway closes in 6 days, so be sure to head on over and get yourself entered for a chance to win. As a note, given the time at which this giveaway ends, you won’t receive it as a Christmas present, but there is nothing wrong with receiving a little late gifting action.